As much as 80 percent of the time related to MTTR (mean time to repair) is spent on identifying the key components, relationships, and people involved to determine the cause of a problem and fix it. In this scenario, an IT operations service group grapples with seemingly unrelated issues that turn into a cascade of problems. 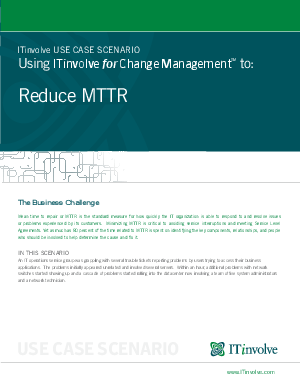 Alternatively, this white paper will examine how the scenario could have gone with ITinvolve for Change Management.